I’ve had a busy few weeks. That doesn’t really explain my lack of posting, because it really doesn’t take me long to write up a blog post. It might explain some of the lack of baking, though? To catch up a little bit this week, I’m posting about the ChocolaTea cake, the blueberry buckle, and the mini chocolate ganache tartlets, all from The Baking Bible. I’ll also give you a little bit of a rundown on the stuff I’ve been up to outside of the kitchen, lately. Quick post. Typing this up from Germany, on my phone, between meetings. 🙂 I made the “Fourth of July” Cheesecake as my birthday cake. Since I wasn’t planning on serving it on the fourth, and since the fourth isn’t a special holiday in Canada, I didn’t make it red, white, and blue. Instead, I made it blue, white, and blue. I realized too late that I should have made it red & white, with strawberries on top, for Canada day, since that’s July 1st (the day after my birthday). Oh well! Next time! I love making pie. The effort/annoyance factor versus payoff ratio is perfect. 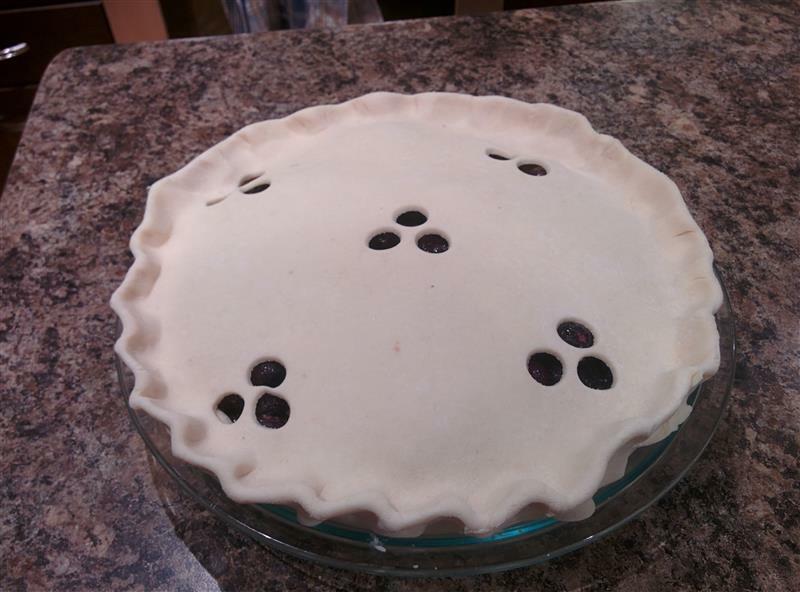 This week, the Rose’s Alpha Bakers group had blueberry-rhubarb pie on the schedule. Ever since the first time I made Rose’s flaky cream cheese pie crust, I’ve had a go-to recipe for pie dough, and it comes out perfectly every single time. I’ve detailed her process for pastry dough before, both on the post about the black and blueberry pie, and the one on the sour cherry pie, so I’ll skip that part of the process here, which, to be honest, doesn’t leave much to talk about. Since Jay’s not a fan of either blueberries or rhubarb (“Yuck! Gross! Disgusting!”), I figured that this would be a good recipe to take to my Thursday BBQ lunch at work. On Tuesday night, I made the pie crust, figuring I’d make the filling and assemble on Wednesday. Then I looked closer at the recipe, and realized that the filling was supposed to cool before going into the shell, so I made it on Tuesday evening, too! Last weekend, when I tallied up the sweets in the house, I made a decision about this week’s recipe from The Baking Bible bake-through. I eat lunch with some of my favourite people that I work, every Thursday. It started as a summer BBQ thing, many years ago, since we’re fortunate enough to have a patio and a grill available for employee use. In the summer months, we pay in a certain amount a month, and someone picks up food for the grill and gets reimbursed from the pool. A couple of years ago, we decided to try a potluck version in the winter – we rotate through main course slow cooker meals, and try to keep it relatively equitable. This week, my contribution was going to be dessert. Doug: It’s quite good. I really like the crust. Doug: You have to say WHY you like it. Me: Yeah, if you don’t give me good feedback, you won’t get quoted on my blog. Matt: I don’t want to be quoted on your blog. It’s good. Doug followed this up with gesturing to the pie with his fork, and saying something along the lines of: Normally, I mean, other than something like lemon meringue pie, the filling just all spills out, and the top collapses. This is actually full of fruit. It’s a nice consistency. Geordie & Jeff agreed with him. So, there you go. I think this week’s heavenly cake bakers choice was perfect timing. It’s definitely quick and easy, but it also involved heating a sugar syrup on the stove, so I got to use the new gas stove, as well as my new oven. We don’t have our cabinets yet, but everything else is in the kitchen. My good friend Matt and his girlfriend came over on Saturday afternoon and helped us move the new appliances in, as well as move the fridge and our old extra free-standing cabinet back into the kitchen from the dining room, so we can cook again!